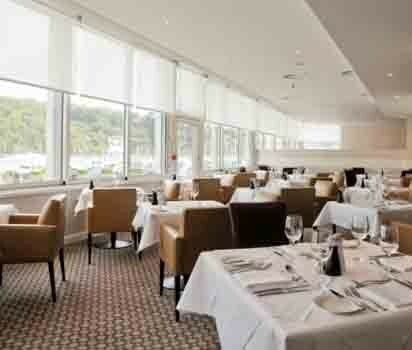 With panoramic views of breathtaking scenery from every window, Dart Marina’s River Restaurant is a fine dining restaurant which holds an AA Rosette in recognition of its high standards of cuisine, and a Strawberry icon which illustrates the Hotel’s commitment to using regional food. Menus combine the very best seasonal ingredients with the light touch of an exceptional chef, and the atmosphere matches the rest of the Hotel – relaxed, chic, understated elegance. Chef, Peter Alcroft delights in using ingredients sourced from the waters, pastures and producers of the South Hams area of South Devon: Blackawton lamb; hand-dived Start Bay scallops; hand-picked crab from Dartmouth and Salcombe; fruit and vegetables from Chalices in Totnes; fresh fish from local day boats; Bigbury Bay oysters; duck from Creedy near Exeter; free range eggs from Cuckoo Farm near Modbury; pork from Poole Farm. Dart Marina chooses to source locally for flavour, quality, seasonality and local distinctiveness as well as to reduce food miles. Tom has a wealth of experience in fine dining and banqueting, and his knowledge of local producers has been the result of living amongst them. He has grown up in Devon and writes his menus with landscape, the sea and great producers in mind.